When we compare the above mentioned recommendations in relevance of the 21st century education as prescribed by the UNESCO with the salient features of Nai Talim , it will be quite clear that these principles and values of sustainable universal education have been manifesting in Nai Talim since its beginning in 1937. 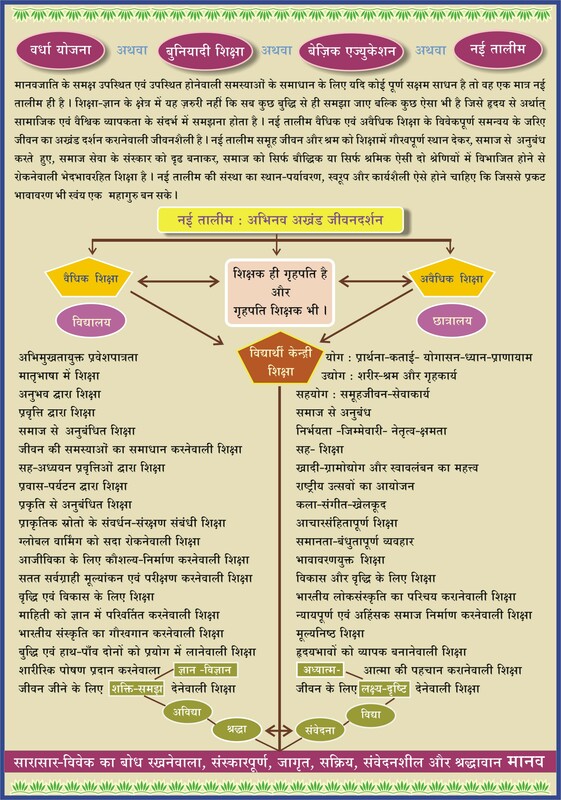 The following plans, programmes and methods of teaching, learning and living activities are carried on in our institution resting on basic principles of education and philosophy of life as mentioned above. In fact, this approach and method is the modern edition of the philosophy of Vinobajion education comprising of Yoga, Udyog and Sahayog. Being an institution working with the rural oriented approach, we lay emphasis on rural development and up-liftment in executing our each and every educational activity. Besides this we have well equipped laboratory, library, computer laboratory, cattle breeding farm, horticulture-nursery, agriculture farm and observatory farm. Special emphasis is laid upon mother tongue as the medium of instruction, not because we discourage the usage of English Language. In fact, we do have English as a compulsory subject for all students. Self-study, correlation, experience and activity based learning make our education live, free from burden and long-lasting. In order to develop the integrated personality of a student and to give them understanding of integrated components of society and the whole life, the syllabus and curriculum are designed with interdisciplinary approach, i.e. keeping the synthetic balance between Vidya and Avidya. We believe in Gandhiji’s vision of making productive manual labour, practical-activity, self-experience and social service as the means of education. According to Shri Manubhai Pancholi, one of the founders of Lokbharti, an educationist, well-read thinker and a literary genius, “Gandhiji’s education philosophy has many things which were earlier said by one or another thinker. But the idea of correlation in education was Gandhiji’s original thought.” Many subjects, taught in Lokbharti, are also taught in other colleges, but, correlation is the distinguishing feature of Lokbharti. This correlation has made teaching as well as results effective. In short, if we understand the term correlation, it explains that any action of a man produces three-fold impact: 1) It affects Nature. 2) It has its impact on society. 3) It also affects one’s own self: the doer of the action. This impact may be direct or indirect, sooner or later, but it is bound to be there. So education should consider correlation as a very important aspect.. Examinations are taken as a part and parcel of studies, interspersed over the whole course, not as something appended to, or coming only at the end of the year and yet oppressive as a result of their being the sole decisive factor of a student’s career. The teacher is simultaneously the examiner also. The atmosphere is almost free of severe fear of examination. The teacher can easily, as a matter of course, assess the abilities of a student while he is at work in class-room, on field, in debates, and in his other activities. This impression and natural assessment helps a lotto decide the result of the student’s performance during the year. There are written formal examination at the end of every semester/year, but the aggregate weightage is equally allotted to the other above-mentioned factors. As this kind of education is the education of learning, we develop the habit of self-study and of creative independent thinking among the students so that one turns himself/herself into a student for ever in his/her life. We expect the student to learn how to learn instead of becoming merely a „bookish learner‟. Occasionally, we also invite external examiners in order to assess the ability (which ability?) developed in our students. 2.1 Experience and activity based Learning. As a whole, we can say that life is nothing but a series of experiences. If the students are exposed to different sorts of life experiences, the learning will be easy, interesting-pleasurable and everlasting for the students. Such teaching approach enables them to acquire value-oriented, realistic, life-long education. This approach of Lokbharti makes the students more mature, responsible and broad-minded citizens. methods such as lectures, questionnaires, interviews, library works, projects, essays (dissertations), tours, camps and work-experiences, self-learning, assignments, group discussions, seminars etc. are adopted for teaching and evaluation in Lokbharti. The combination of all these different methods makes teaching lively, interesting and meaningful. To impart practical experience to students, relief work is done by students and staff alike, during famines, floods, cyclones, earthquakes and communal riots in Gujarat and distant parts of India such as Orissa, Bihar, Bengal and Assam. 2.2 Tours, Trips, Celebration of Festivals, Camps and Cultural Activities etc. educational and cultural tours and short trips are organized with students responsibility every year.?? Further, celebrations of national and cultural festivals, anniversaries of saints and great men, special days, national weeks, walking tours, camps in villages, adivasi deprived area study camps, stay at farmers home to understanding their life style, staywith? for understanding and working in khadi gramodyog production centers, organization of local folk fairs, cultural programmes of ballads and folk songs, dances and dramatics are arranged occasionally. The latent talent of the students for study, art and administration gets proper platform during such occasions. Unless, due importance is given to the dignity and inevitability of socially useful productive labour, society without disparity of class cannot be achieved and brought into existance. This accustoms students for whole day’s outdoor labour and brings them mentally and empathetically nearer to the real day-to-day life of the poor wage-earning labourers of our country. This is in accordance with the firm belief of Lokbharti that socially useful productive manual labour must be an integral part of our routine life, which is the base and breath of our social-economic life and hence it is an integral part of Lokbharti’s education system. An in-depth study report titled as “Our Common Future”, prepared by experts and carried out by the UNESCO, on the cultural and natural scenario at present has raised a crucial question regarding mankind. The report comes out declaring an ironical fact that the mankind knows how to be a part of genocide or dying together but has not yet learned how to live together! Community life during education offers solution to come out from this dilemma. Lokbharti has attached prominent significance to community life in the chhatralayas. The founders of Lokbharti had rich experience of decades of educational community life, where it was found that chhatralaya is a nursery of peaceful-cooperative citizenship and the best medium of holistic and balanced personality development students. 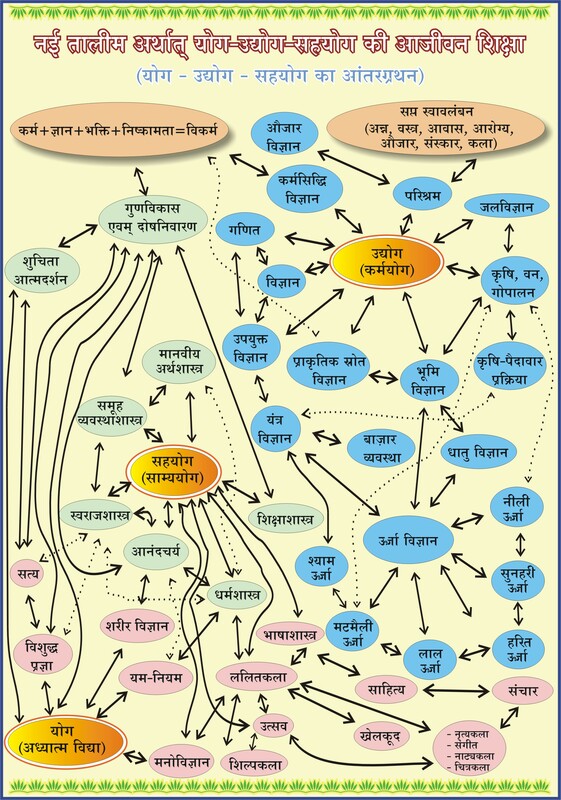 Hence community life has been inevitably linked to all academic activities and sections of Lokbharti. Even if student has got first class in his subjects, but his community life is found unsatisfactory and, in-spite of our enough guidance with the help of his family member, if desirable changes are not seen in his behaviour, he is not promoted to the next academic semester. Except in Lokbharti, this community life in a chhatralaya is not regarded as an integral part of syllabus in any college or faculty anywhere in India. It teaches us how to live together, keeping aside our own ego-centric likes and dislikes, sharing our pleasures and sorrows with one another, reducing the conflict and unhappiness and thereby developing harmony and lively brotherhood. Therefore, the hostel life is in the center of our educational system. In a hostel, the students learn to live and work together in harmony, doing socially useful productive work on campus. Thus, whatever knowledge and skills student acquires is in the context of a close contact with society and its healthy development. The unique quality of our system is to educate the students in such a manner as thereby to achieve holistic development of our rural community. This institution is a residential one and it is compulsory for every student to stay in hostel. various house-hold duties of the hostel are rotationally performed by the inmates themselves, which provides good training to them. Every hostel has its own separate kitchen and store, which is also managed and looked after by the inmates of the hostel themselves. A unit of 30 to 40 students stay in one hostel as a joint big family, under personal care and guidance of a rector (Gruhapati). Not only that, there exists a committee (Gruhapati Mandal) of all the rectors headed by the chief-rector (Mukhya Gruhapati). This committee, comprising of rectors and even includes principals, the director and other managerial persons, which not only takes care of physical infrastructure regarding hostels but also lays more emphasis upon the character-building, personality development and shaping of students’ attitude by continuous analysis of the related factors. The compulsory residence on campus for the faculty members is proved remarkably impressive for the students’ overall development and happiness. Besides , all family members of faculties fill the emotional vacuum of the students through love, warmth and guidance as well as removing home sickness among them. Co-education is a natural and compulsory requirement for our educational activities and emotional healthy atmosphere on the campus. It is necessary for a full and balanced development of the human individual as a unit of society. It is natural to have mental-physical attraction between boys and girls at this age but the relationship between them should not be got perverted. The sublimation of such kind of feelings should be done for the healthy relationship. Boys and girls work together in so many activities of community life. We believe in “Have a fence between boys and girls but don’t build a wall”. Thus, co-education prepares students to comprehend gender equality of man-woman as natural, mutual, essential and healthy. It is a well-known factthat as the development of the individuality of a student takes place, it gives rise to some emotional and behavioral problems in his life. Proper care is taken that personal, skill guidance is given to every student with utmost love and concern in the development of his emotional-behavioral life. Along with it, competent teachers-family members give advice and discourse at the time of group prayers in the evening, regarding various aspects of behaviors in personal and community life. This governing body of students easily creates a sense in the minds of the students that they are responsible members of a family. This body manages all the activities of the students and executes various programmes with the help of elected secretaries, who are elected for one term by students. Messing, sanitation, co-operative store, finance, festivals, literary activities, reception and hospitality of guests and nursing of the sickall of these is looked after by sub-committees one under each elected secretary. The general secretary is elected unanimously by the representatives of all hostels. Physical, disdainful, harassing punishment in any form is absolutely eschewed in principle as well as in practice, which is strictly and scrupulously adhered to by all the members of the staff. Competition and Prizes have no place anywhere and in any form in the institution. Simplicity prevails here among all the students and faculty members. We have accepted Khadi, and preferred Swadeshi and Gramodyog products with specific purpose. By accepting them with understanding, it helps us to tune our sensitivity and empathy with the deprived and the poorest of our nation. Further, it also teaches us how to make judicious use of natural resources. Even the infrastructure and buildings on the campus have multi-purpose usage, not because of the financial strain every time, but to promote simple life-style. Thus, on the whole simplicity implies our effortless life-style for sustainable development. Apart from the transmission of knowledge, the emphasis is laid upon the development of the spirituality among the students. Care is to be taken to nurture the sensitivity, co-operation and spiritual sense in them through the collective evening prayer. The prayer session includes „Sarva Dharma Prarthana, Bhajan-Dhun’ and reading of inspirational writings and interesting anecdotes from the lives of great personalities. Cultural programmes and performances develop artistic interests and aesthetic sense among them.